Free Standard Shipping for all Full DualLiner bed liner and ZeroSkid™ Rubber Floor purchases. Free Shipping excludes partials or special orders for individual parts (for example only a tailgate panel) *Free Shipping applies to delivery within the Continental United States (orders typically arrive within 3-7 business days. Shipping to Alaska, Hawaii and Canada is available for an additional fee; please contact Customer Service for a shipping quote.) This offer does not apply to International or DualLiner Distributor orders. Illinois, Iowa, Minnesota, Missouri, Nebraska, North Dakota, South Dakota, Wisconsin. The map at the right shows transit times for FedEx ground shipping. DualLiner bed liner products are rated as Oversized and shipping costs are calculated by dimensional sizing. 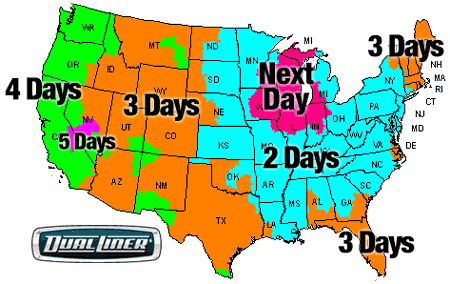 If you are interested in expediting a DualLiner order, contact Customer Service for a quote. Please note, at this time we are unable to ship to P.O. Box addresses. In stock orders received weekdays by Noon CST will ship same day. Ground shipping transit time is typically 3 – 7 business days. DualLiner reserves the right to hold any order for a security review. If your order is affected, you will be notified within two business days. DualLiner accepts returns for thirty (30) days after shipment. Buyer is responsible for all return shipping costs. Defective products are returnable for 30 days without restocking fees. Non-Negotiable 10% Re-Stocking and 10% Re-Boxing Fees apply to all non-defective returns or exchanges. Shipping costs are non-refundable. Customer must request a return authorization (RA) by contacting the returns department by phone 800-992-1949 or e-mail at customerservice@DualLiner.com. A RA number will be issued with instructions for returning the package within two business days. All returns without an RA number or sent COD will be refused. All packaging materials and parts must be included for a refund. We reserve the right to refuse returns with missing parts. Products damaged by the customer during installation may be given a partial refund or refused altogether. Claims of shipment damage, incorrect/missing items, or non-receipt of goods must be made within 10 days. We will require photographs as proof of damages or defects before the return process is initiated. We will refund the original form of payment, excluding any applicable return shipping costs. DualLiner will confirm receipt of the Return and verify refund processing within 3 business days of receipt. Please allow 5 – 7 business days for your bank to process the credit.